It isn't quiet out there, on the other hand. In Lutheran cyber space there's plenty of banter, more than usual, it seems. 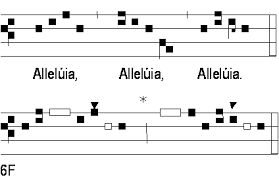 The lastest is the flap over whether or not omitting alleluia during Lent is stupid. Here's where it began. Rev. Paul McCain called the omission of Lenten alleluias "stupid," with an evident awareness that it would generate a negative response among us. "Apoplexy" was the kind word he used. And then he went on to say that for the sake of unity he follows the rubric anyhow, a remarkable admission in itself. At first I paid no more attention than to shrug. What else is new? But today I read a brilliant response to Rev. McCain by Dcn Latif Gaba, which is a very worthy read. It positively skewers Rev. McCain. Go ahead, see for yourself, here. I'll wait. In addition, there is a thoughtful defense of omitting the Alleluias in Fr. William Weeden's blog, a quotation from the sainted O.P. Kretzman (here), which even McCain acknowledges to be a point well made, though he dismisses it without further comment. He might have observed that the Western Church's emphasis on penitence during Lent is a salient attribute of it over against the East, though this observation is not made to denigrate the East (which has its own salient and laudable features). Yet particular Western penitential Lenten practices are worthy of defending, such as the omission of Alleluias, or, during Passiontide, the veiling of images and the omission of the Gloria Patri. It's actually amusing to hear McCain lambasting the Western omission of the alleluias. Next thing you know, he'll be sporting a beard. But what really merits further scrutiny is the idea of doing certain liturgical things merely for the sake of unity. Rev. McCain's chief argument is that "since it is adiaphora, I am happy to give up a bit of my freedom and personal opinion for the sake of unity. We’d all be better off if we did that." There is some merit to this, as anyone who is liturgically minded not only can but routinely does attest. That is a major reason for being liturgical: we do what the Christian Church has always done. But let's not commit dicto simpliciter and take a good thing too far. The point of rubrics, after all, is also to teach with respect to the very things they do. Not only, that is, do liturgical actions portray a uniformity with others who do them the same way; there happens to be a reason we do them which relates specifically to the matters concerning which they are done. We kneel at the altar not just to be doing the same thing together, but because Christ's Body is really there. We make the sign of the cross as Christians have done it for centuries, but the chief reason we do it is because it is the mark of the baptized. We certainly do not maintain practices we know to be stupid. As Dcn Gaba said it, "the worship of Christ our Immanuel deserves more than the merely stupid." Moreover the rubrics, while expecting a general uniformity, have also acknowledged local circumstances, at least in a rather limited way. One of my favorite such historical circumstances is the origin, in Paris, of the elevation of the Host, in the mid-thirteenth century. The elevation arose out of the piety of the people, or of the bishops, or both, in response to the wild ruminations of one Peter the Stammerer, who (no doubt while rubbing his chin) confidently averred that the elements did not become the Body and Blood of Christ until all the words of institution were completed. In response to this the practice arose of elevating the Host immediately after the words pertaining specifically to it, as a confession against unsavory philosophical meanderings. Soon it took hold across the entire Western Church. "For instance, some might think throwing themselves on the chancel floor is a great way to observe Good Friday, but we don’t do it, that is, if we care about unity. Some think putting the Lord’s Supper away in a Tabernacle on the altar and claiming it is perpetually the Lord’s body and blood and adoring it is a good thing, but we don’t do that. We know better." Yes, it is true. Some do think putting the Sacramental reliquae in a Tabernacle on the altar is a good thing. I don't know exactly how the practice of reserving the reliquae in a tabernacle arose, but I do know it is ancient, and virtually universal in the older history of both the East and the West; so therefore there is, after all, an ingredient of unity in its retention (oddly, Rev. McCain might be obliged to agree with me on this, by his own reckoning!). But some think that in itself is still not really a good enough reason for having a tabernacle. Some think it its use is a laudable practice precisely because they claim--over against those who deny that it remains the Lord's Body and Blood--that the Sacrament is what Jesus said it was. Some think it foolhardy to say you "know better" than what Jesus said. And some find that having a tabernacle makes it easier to discover those who say they believe what Christ said about those elements, but who, when put to the test, seem more apt to believe that He only meant it temporarily at best. See? Rubrics do have more meaning than 'unity' after all.